Los Angeles County Supervisor Don Knabe offered his support and cautious optimism today to a tentative settlement reached by parties involved in litigation over the expansion of Los Angeles International Airport (LAX). Under the settlement, the City agreed to halt so-called yellow-lighted projects until such time as the projects could be reexamined for future benefit to LAX. One such project was a controversial remote passenger check-in facility east of the airport. Other green-lighted projects will move forward, such as the realignment of the south runway complex and construction of the West Terminal and an automated people mover. 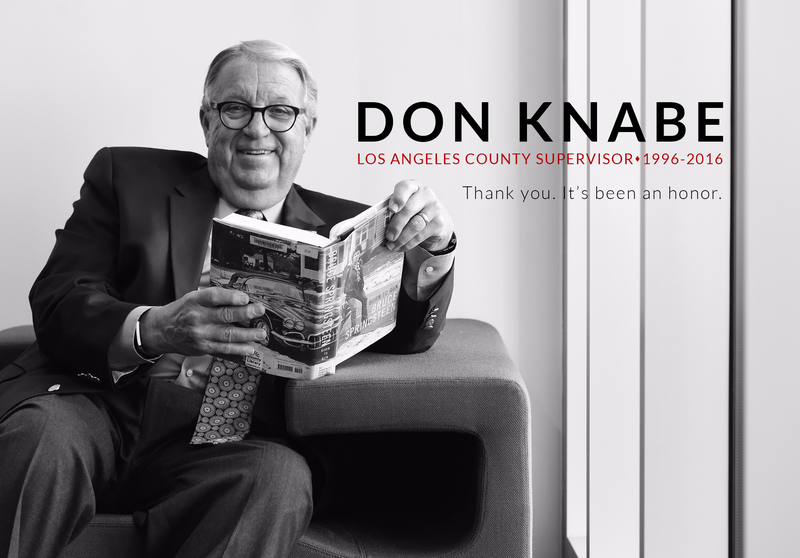 The operation of LAX impacts a vast community that extends beyond the borders of the City of Los Angeles, said Knabe. The massive expansion originally envisioned for LAX would have caused an unacceptable encroachment not just in Los Angeles, but also Inglewood and El Segundo and Culver City and other neighborhoods nearby. This settlement represents a balanced approach to the future of LAX, as well as addressing the concerns expressed by the County and the cities surrounding the airport. Knabe also offered his thanks to Mayor Antonio Villaraigosa for his desire to explore the need for a stronger regional network of airports. We cannot put all of our air traffic and air cargo at a single facility. The future success of our region’s ability to move goods and passengers through our airports rests solely on taking a regional approach to our airports, said Knabe. This settlement is a first step to ensure that we have several strong airports regionally, not just a single, overburdened facility. Supervisor Don Knabe announced today that a new traffic signal and curb ramps will be installed in Rowland Heights at the intersection of Fullerton Road and Sunrise Drive. This will be part of the County’s ongoing road construction and maintenance program, and is expected to improve conditions for motorists and pedestrians. The new addition is included in the Fiscal Year 2004-05 Road Fund Budget and is estimated to cost between $90,000 and $105,000. The project complies with the California Environmental Quality Act. To increase contractor awareness of our program and to contract work to the private sector, this project will be listed on the County website for bids which will begin August 3rd, said Knabe. The participation of the private sector in public developments provides a united sense of community which will help keep our streets both maintained as well as safe. The project is scheduled to be completed within 30 days. Work will commence in December 2004. Once work begins, Fullerton Road may be reduced by one traffic lane in each direction, and Sunrise Drive may be reduced to one traffic lane for both directions, controlled by flaggers. Lane reductions will only be in effect during working hours. Chairman of the Los Angeles County Board of Supervisors, Don Knabe, today announced the funding of $405,000 of his Fourth District Proposition A funds for the Palos Verdes Peninsula Transit Authority’s Shuttle Service. Despite tough budget times, it is important to continue to fund important projects such as the shuttle in Palos Verdes, said Knabe. Local transit projects are important throughout the County. Every person we get out of a car and into a bus is less traffic and less pollution. The $405,000 will be used for fiscal year 2004-05 and will help continue the Shuttle service. Los Angeles County Board of Supervisors Chair Don Knabe has announced plans to contract for construction of reinforced concrete box and pipe storm drains and related structures in the vicinity of Industry and Hacienda Heights. The contract will also provide for the reconstruction of asphalt concrete pavement, curb, gutter, sidewalk, and driveways as needed as a result of the storm drain construction. Work will take place on Clark Avenue, from Ridley Avenue to Ninth Avenue; Ninth Avenue, from San Jose Creek to Gale Avenue; Gale Avenue from Finegrove Avenue to Ninth Avenue; Palm Avenue from Finegrove Avenue to Ninth Avenue; Ridley Avenue from Palm Avenue to Wedgeworth Drive and from Los Robles Avenue to Lujon Street; Los Robles Avenue from Ridley Avenue to Ninth Avenue; Lujon Street from Darley Avenue to Ridley Avenue; and Valencia Avenue from Clark Avenue to Folger Street. This project is part of the County’s program for the construction, repair, and rehabilitation of its extensive flood control system and will provide flood protection to the local area. The County Department of Public Works will open bids May 18 on a contract to perform the work. Public Works expects the work to start in August and take 180 working days to complete, ending in May 2005. Once work begins, Gale Avenue may be reduced to two traffic lanes, one lane for each direction, during daylight working hours. Chairman of the County of Los Angeles Board of Supervisors Don Knabe announced plans to contract for the installation of traffic signals at the intersection of Leffingwell Road and Santa Gertrudes Avenue, et al., in the vicinities of Industry and Whittier. Improvements will also include modification of traffic signals and construction of curb ramps. This project is part of Public Works’ ongoing highway construction and maintenance program to provide for improved traffic flow and safety for drivers and pedestrians. The County Department of Public Works will open bids May 18 on a contract to perform the work. Work is expected to take 25 working days, with an estimated start in June and completion in July. During construction, Leffingwell Road, Santa Gertrudes Avenue, Lambert Road, and First Avenue may be reduced by one lane in each direction with the left-turn lane closed when in conflict with construction. Seventh Avenue may be reduced to two traffic lanes, one lane for each direction, and a left-turn lane where existing. Clark Avenue will maintain at least two traffic lanes, one lane for each direction, and a left-turn lane where existing during construction. Local access will be maintained at all times. Chairman of the County of Los Angeles Board of Supervisors Don Knabe announced plans to slurry seal various County streets in the vicinity of Whittier. Slurry seal is a mixture of asphalt and sand applied to existing pavement to seal minor cracks and extend the life of the roadway. This project is part of Public Works’ ongoing construction and maintenance program to improve highway facilities for the traveling public. The County Department of Public Works will open bids May 11 on a contract to perform the work. Work is expected to take 50 working days, with an estimated start in August and completion in October. Once work begins, project streets with four traffic lanes may be reduced to two traffic lanes, one lane for each direction and a left-turn lane where existing, during daylight working hours. All other project streets may be reduced to one traffic lane for both directions, controlled by flaggers, during daylight working hours. Local access will be maintained at all times. Chairman of the County of Los Angeles Board of Supervisors Don Knabe announced plans to contract for improvements to Scott Avenue, between Mulberry Drive and Leffingwell Road, in the vicinity of Whittier. Improvements will include reconstruction of roadway pavement, curb, gutter, sidewalk, driveways, and cross gutters; construction of curb ramps and masonry retaining walls; root pruning and planting of parkway trees; and modification of traffic signals. This project is part of Public Works’ ongoing construction and maintenance program to improve highway facilities for the traveling public. Work is expected to take 75 working days, with an estimated start in August and completion in November. Once work begins, the left-turn lane on Leffingwell Road that allows traffic to turn on to Scott Avenue may be closed. Scott Avenue and all other project streets at their intersection with Scott Avenue may be closed to through traffic during daylight working hours. Local access will be maintained at all times. Los Angeles County Board of Supervisors Chair Don Knabe has announced Board approval of a $1.3 million contract with LNI Custom Manufacturing, Inc., of Hawthorne, for the installation of solar-powered bus stop shelters at various bus stops around the County, including in the vicinity of Whittier. Work will include the installation of non-advertising solar-powered bus stop shelters and solar light poles and related work. This is part of the County’s ongoing program for the construction and maintenance of transit facilities, and will improve the bus stops while reducing reliance on purchased electricity. The County Department of Public Works received six bids on the project. The highest bid was $2.3 million. Grants from Caltrans and the MTA as well as Proposition A Local Return Transit Funds will finance the project cost. Public Works expects the project to be completed in 60 working days, with an estimated start this month June and completion in July.